What can I use Predictive Analytics for in my Supply Chain? You are probably familiar with some of the more “classic” predictive modeling applications in the supply chain such as demand forecasting and transportation planning tools. Advances in processing capabilities and maturing technologies such as NoSQL databases and Hadoop clusters enable us to speed up and extend these classic applications. Machine learning complements traditional linear programming and other algorithms to make “smarter” data-driven predictions. Below are some of the more popular uses for predictive modeling, analysis, and machine learning techniques in the supply chain. Tracking service levels is an important aspect of maintaining a customer focus. If predictive analytics can provide alerts to when orders or shipments will be late, account representatives can intervene to either notify the customer or help move the order along. Advanced algorithms take inputs from various sources (traffic patterns, carrier pickup times, weather data, etc.) to compare current events against historical measures and estimate service levels for order and shipment delivery. This provides opportunities to proactively influence customer service. Understanding what items are sold together helps in product placement in the store and improves key store metrics such as average basket size, average ticket size, and overall store revenue. In addition, similar association rules can be utilized to understand how similar items should be stored in the DC and replenished together to the store. These algorithms are widely used outside of the supply chain combined with recommendation engines to make it simple for customers to add complimentary items to their basket at checkout. Often companies get stuck with inventory that they need to write-off or sell at a significant mark down. Predictive analytics allows you to identify items that are in danger of becoming obsolete based on similar products, historical data, and quick changes in demand. Algorithms can notify Inventory and sales personnel of these SKUs and recommended to sell them through a promotion in another channel (e.g. online) or to send them to alternative stores to sell them quickly without a significant mark down. 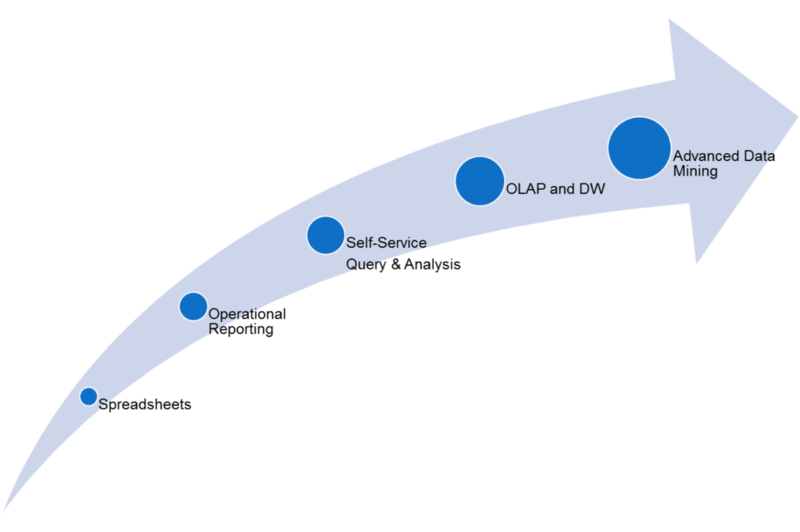 As you can see from the BI Maturity Model below, after companies have had success with operational reporting, self-service analysis, and have successfully brought their supply chain data into a centralized data warehouse, they are well positioned to move on to the next level of predictive analytics, which is part of an advanced data mining strategy. Agillitics is a full service business intelligence and analytics consulting firm that focuses on supply chain systems. The Firm works across industry verticals to help clients leverage their data to measure and improve operations, increase sales, and meet complex customer demands. For more information, please visit www.agillitics.com.